Looking for deals in Leeds? Situated 0.2 miles from the First Direct Arena in Leeds, ibis Styles Leeds City Centre Arena features an onsite restaurant and bar. Free Wi-Fi is available throughout the property. the whole experience was great, comfortable, clean, friendly, great location, and stylish. highly recommended. Set in a grand Victorian building in the heart of Leeds, this boutique hotel offers free Wi-Fi, luxurious rooms and elegant lounges. It's not too big, and a building with character. It's very central. It's very comfortable. Good breakfast. Simple bar with a decent lager on tap. My room was quiet considering the loacation, some others reportedly less so, if you're very sensitive to traffic noise ask for this to be taken into consideration. The Queens hotel - QHotels is the heart of Leeds city centre, and offers a grill restaurant and luxurious 4-star rooms with free WiFi. Everything particularly the heated towel rail and fluffy towels and the excellent quality of the food both at breakfast and in the evening. I could also leave my luggage in their safe keeping after checking out before leaving later for the airport for my flight back to Spain. DoubleTree by Hilton Hotel Leeds City Centre is situated in the waterside Granary Wharf area, only 2 minutes' walk from Leeds Railway Station and a 7-minutes' walk from the city centre shops. location, friendly staff. Room very clean, good size. With private parking, a stylish restaurant and fitness centre, Novotel Leeds offers spacious rooms. 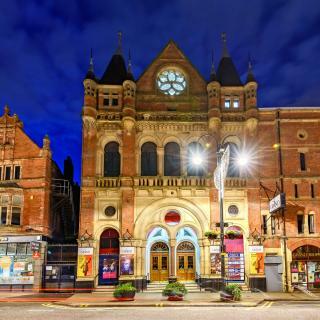 The hotel is situated in central Leeds, just 3 minutes' walk from Leeds Rail Station. Hotel and people are just great! In the heart of Leeds, Crowne Plaza offers a luxurious spa, an indoor swimming pool and modern rooms, and Leeds’s bustling shopping area is just a 10-minute walk away. Location, ability to park, clean room, friendly staff. Oulton Hall is an 18th-century mansion and has an award-winning cuisine, a spa, and a 27-hole championship golf complex in its grounds. Made so welcome from arriving there. Allxstaff so attentive but not over the top. In the heart of Leeds city centre, this Grade II listed hotel is just a 3-minute walk from Leeds Rail Station. I would definitely recommend The Met for business and leisure. Village Hotel Leeds South boasts a stunning 25-metre indoor pool, chic rooms with plasma-screen TVs and a choice of dining experiences are all offered at this contemporary and stylish 3-star hotel. excellent everything was good..
With an impressive leisure centre and a restaurant, Village Hotel Leeds North offers modern rooms with free WiFi. 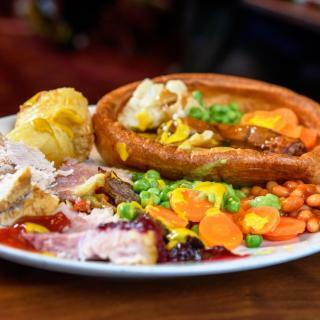 The hotel is situated in Headingley, 10 minutes’ drive from Leeds centre. Everything either met or exceeded my expectations. The staff were extremely pleasant and attentive. In Leeds' business district, close to shops and nightlife, this hotel is less than 10 minutes’ walk from Leeds City Station. It offers stylish rooms, and an open-plan restaurant & bar. This hotel has everything, staff is very kind and the room is really nice and clean! Just 100 metres from Leeds Rail Station, the Discovery Inn – Leeds has a 24-hour front desk and is only 5 minutes’ walk from the shops, restaurants and bars in Leeds’ city centre. Nice and central hotel for a reasonable price. Set in 9 acres of wooded grounds, the 4-star Weetwood Hall Estate is a 17th-century manor house with an award-winning pub. The hotel is just outside Leeds centre, a 10-minute drive from Leeds Airport.... The hotel is in an excellent location - loved the buildings, the pub, etc. With free Wi-Fi throughout, air conditioning and free breakfast, the Holiday Inn Express Leeds City Centre overlooks a canal and is located next to the Royal Armouries Museum and The New Dock Hall. Perfect. Location, room, staff and breakfast. More than I have expected for the price paid. Woodlands Hotel is a stylish contemporary hotel surrounded by picturesque grounds with complimentary car parking. Woodlands is just 10 minute’s drive from Leeds City Centre. One of the best hotels I stayed in recently, will be definitely staying there again! Located in Leeds city centre, the Marriott is just 5 minutes’ walk from Leeds Rail Station and opposite the Trinity Shopping Centre. Simply excellent! Great location, luxurious and spacious rooms. Spa and gym are top notch. 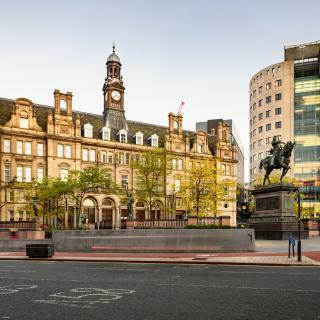 Set in the financial district of Leeds, Mercure Leeds Centre Hotel is approximately a 5-minute walk from Leeds Train Station and a short walking distance from all that Leeds has to offer. Everything, the room was so nicely decorated. Located in Leeds, with good links to links to the M1 and M62, Holiday Inn Express Leeds-East has a shared lounge, a bar, free parking and rooms with free WiFi access. The location, easy to find. The beds were extremely comfortable and the room was inviting. Headingley Lodge forms part of the Emerald Headingley Stadium Complex and has good access to Leeds city centre. Excellent hotel with pleasant staff. Value for money for quality rooms. What are the best hotels to stay in Leeds? Dakota Leeds, Quebecs and ibis Styles Leeds City Centre Arena are some of the popular hotels in Leeds. What is the best neighbourhood to stay in Leeds? University District, Leeds City Centre and Trinity Quarter are popular with other travellers visiting Leeds. What hotels in Leeds have nice views? DoubleTree by Hilton Leeds, Park Plaza Leeds and The Queens - QHotels have received great reviews from travellers in Leeds regarding the views from their hotel rooms. How much is a hotel in Leeds for tonight? On average, it costs US$72 per night to book a 3-star hotel in Leeds for tonight. You'll pay on average around US$107 if you choose to stay in a 4-star hotel tonight, while a 5-star hotel in Leeds will cost around US$172 (based on Booking.com prices). What are the best hotels in Leeds near Leeds Bradford International Airport? Travellers who stayed in Leeds near Leeds Bradford International Airport (LBA) have said good things about Chevin Country Park Hotel & Spa, Britannia Leeds Bradford Airport and Mercure Leeds Parkway Hotel. What are the best hotels in Leeds near Leeds Arena? Some of the best hotels in Leeds near Leeds Arena include Dakota Leeds, ibis Styles Leeds City Centre Arena and Mansio Suites Basinghall. What hotels in Leeds are good for couples? These hotels in Leeds are highly rated by couples: Dakota Leeds, Quebecs and ibis Styles Leeds City Centre Arena. Which hotels in Leeds are good for families? Many families visiting Leeds loved staying at Dakota Leeds, Clayton Hotel, Leeds and Woodlands Hotel. How much does it cost to stay in a hotel in Leeds? On average, 3-star hotels in Leeds cost US$81 per night, and 4-star hotels in Leeds are US$120 per night. If you're looking for something really special, a 5-star hotel in Leeds can on average be found for US$200 per night (based on Booking.com prices). What hotels in Leeds offer an especially good breakfast? 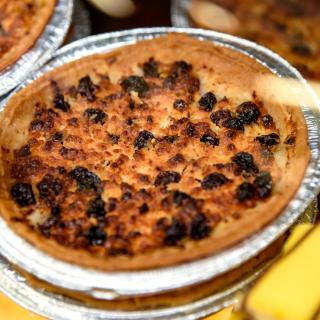 For hotels in Leeds that serve up a highly-rated breakfast, try Dakota Leeds, Clayton Hotel, Leeds and Quebecs. How much is a hotel in Leeds for this weekend? The average price per night for a 3-star hotel in Leeds this weekend is US$272 or, for a 4-star hotel, US$308. Looking for something even fancier? 5-star hotels in Leeds for this weekend cost on average around US$364 per night (based on Booking.com prices). Stylish, Stately and A Shopping Haven! Between Bronte Country and the Yorkshire Dales, Leeds is a stately city with a wealth of impressive Georgian and Victorian buildings. The most celebrated is the town hall, a Grade I-listed gem with a huge clock tower supported by columns. Just around the corner is the understated Leeds Cathedral, and between the two is Millennium Square, a large urban space that plays host to outdoor concerts and a German Christmas market. Shopping in Leeds is fantastic. Kirkgate Market is Europe’s largest covered market, and the magnificent, round Corn Exchange is home to exclusive boutiques. The city also has the first Harvey Nichols outside of London, as well as the usual high street brands. As home to 2 large universities, Leeds has a young and vibrant vibe. It has repeatedly been voted the clubbing capital of the UK and is home to the Leeds Festival, an annual music event that attracts thousands. The city also has excellent sporting pedigree. 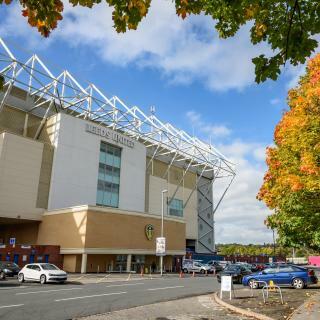 Internationals are held at Headingley cricket ground, and Leeds United FC and the Leeds Rhinos rugby league team are well-known names in their fields. 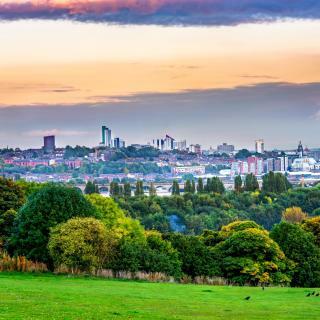 On the outskirts of the city are wonderful Roundhay Park, Kirkstall Abbey and Leeds-Bradford International Airport. Leeds accommodation on Booking.com covers all areas of this elegant city. I went to see my grandson at the theatre, but the city with its historical buildings was very impressive that I would like to return for a closer look. I had a lovely meal near the theatre which was in Ceciela Street off York Road, it was a Brazilian restaurant. I managed to find the theatre on foot so I would say it is quite easy to get a round. They have some lovely theatres that would be good for a solo traveller. Not a fair question really, as we were visiting relatives, so not sight seeing. But know Leeds has excellent shopping and within a short ride of beautiful countryside. Excellent restaurants, shows Excellent sport to view. The Trinity shopping Centre is amazing, loads of good quality shops, and eating places. Street dancing and entertainment all led to a great atmosphere. Huge town centre with loads of interesting places. Wanted to go to royal armouries but no time. Northern Snooker Centre is a very well run with great staff. We went to the wool show at the grammar school. We went to the wool show at the grammar school. Was a bus ride away. Bus station was 5 mins away from hotel. Was very central. Loads of places to eat nearby. Definitely will be back. We loved it in Leeds. We are from Birmingham. We were attending a concert at the Arena so the Hotel was a good base to stay in plenty of shops and places to eat near the hotel.We got a taxi to the station which was reasonably priced (£5.00) and the hotel staff were very helpful as to where places were to eat and how to navigate our way around.We liked the free hot drinks machine which was available in the Hotel reception area.Would liked to have stayed a bit longer to explore more of Leeds a most enjoyable stay. We stayed at the Double Tree Hilton in Leeds. Everything, the room was well equipped, clean and comfortable. Staff were friendly and very helpful. I have food intolerance and allergies which they catered for without any problem. Menu choices were plentiful. Location was fantastic. A bus stop was outside the hotel which took you into Leeds city centre for a low cost. This was better than taking the car and paying for parking as this was expensive. Taxis weren't expensive neither. Overall a fantastic break away and would definitely stay here again. The hotel is in a great location easy walking distance from Leeds station and City centre - but lovely and quiet too. It's stylish and modern while also being incredibly friendly and welcoming. The room was perfectly equipped - huge, comfy bed too. I had a personal issue during my stay meaning I needed access to a laptop and phone, and the front desk staff were so helpful and understanding. Very highly recommended. Everything! No frills of course but that keeps the cost low. Bed comfortable, room temperature good, lovely hot water in en suite, clean and so well placed in Leeds City Centre. I guess the idea is that you are there to enjoy visiting the city/family/friends or for work and not to just stay in the hotel - it's a good value, functional crash pad and I'd recommend it. Great City centre location. Very clean rooms. Really good full English breakfast buffet style and as much as you want to eat! An older hotel but with modern facilities and full of character. I’ve used this for business and it was so good and good value I now use it whenever I travel to Leeds. Highly recommended. The hotel was amazing value for money. I would definitely come again! The shower and bath were lovely and the addition of the sofa in the room was great! Definitely will stay again if I come up to Leeds because it is a lovely place with a great location and links to the city centre. Nice clean room. Staff friendly. Very close walking to the Trinity shopping centre and city centre. Discount parking given for city centre car park. Free Wi-fi. Very close to the station if came by train. The staff were friendly and polite and the place was clean and comfy . near the city centre wat more do you need as a stay over! The hotel is in an excellent location - loved the buildings, the pub, etc. and plenty of places to sit to catch up with visiting friends. Staff were excellent - from check in to breakfast. Everything either met or exceeded my expectations. The staff were extremely pleasant and attentive. Very modern and clean, Comfy bed. excellent choice for English and continental breakfast.